Should our Retro Eriba Puck just too small for something then we have something big brother for you to rent with a little more freedom of movement, the Eriba Retro Pan. 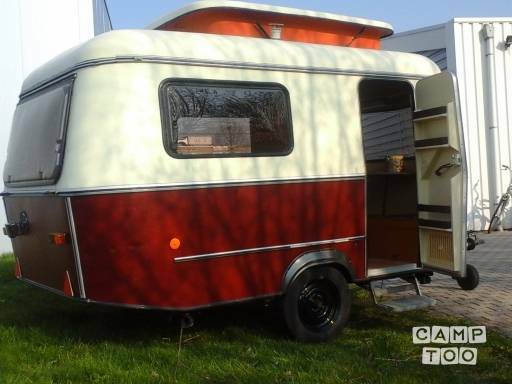 This is also a double caravan including a lifting roof. The Eriba Pan Retro features a central kitchen with two seating areas. The caravan has a sink, stove, gas stove and a fridge freezer. Just like the Retro Eriba Puck The spacious dining area does get to be converted easily in the evening to a lovely double bed of 1.90 x 1.40 meters. The Eriba Retro Pan has a height of about 1.87 meters and a curb weight of 515 kg. Pan can be loaded up to 750 kg. The same goes for the Eriba Retro Pan as Puck, to be able to link this caravan behind your car, you need a B license. Our Retro Eriba Pan has BOVAG inspection of 2016. The locker we have removed to the front in 2016 and replaced by a bicycle carrier. required if you are going abroad with HYMER.